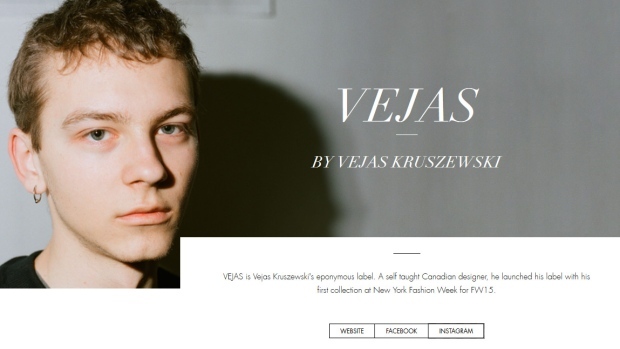 Vejas Kruszewski is shown on the LVMH Prize website. TORONTO -- Self-taught phenom fashion designer Vejas Kruszewski is not the kind of artist prone to outbursts of glee. Even after winning a prestigious fashion prize awarded by heavyweights including Karl Lagerfeld and Marc Jacobs, the low-key Canadian teen prefers to focus on the pragmatic issues at hand. "It feels good. But it's over now so it's kind of back to work," Kruszewski said Monday from Paris, where he last week won the prize, which comes with a cheque for 150,000 euros (C$217,000) and a year-long mentorship. "We have to meet with the mentor and put together a plan with how things are going to go forward and we're just going to think on the best possible trajectory to go in." The 19-year-old had been in contention for the LVMH Prize, an award for emerging designers spearheaded by the luxury goods conglomerate LVMH Group, which includes fashion brands Louis Vuitton, Celine and Givenchy. The award went to London-based designer Grace Wales Bonner, who claimed 300,000 euros (C$435,000) and a year-long mentorship from the LVMH group. But the jury decided to hand Kruszewski -- who was the youngest designer ever to be in contention for the award -- a special prize in recognition of "a mature style and independent spirit." His Toronto-based label, Vejas, has quickly grown from a personal passion to a fledgling global enterprise, and Kruszewski says he's eager to keep the momentum going. "Our infrastructure is kind of lacking right now. We need a larger office space because we're outgrowing it; we'd really like to invest money into our production cycle because right now it just needs to be strengthened; people need to be paid on time, which just helps things go smoother," he said of the list of things he hopes the prize money will fund. "We also kind of want to be putting money into developing things like footwear and leather goods, which in the long-term are what become the pillars of a healthy brand." Kruszewski says he expects to develop footwear samples, and eventually launch production, in Italy. The rest of the line will remain in Toronto -- for now. "I don't think it's going to be possible to be operating on a certain level and staying there," he says. "It's really a logistics thing -- where the skilled labour there isn't necessarily immediately available and all the suppliers and the manufacturers are in Europe -- that it makes a lot more sense to be in a European city." Kruszewski grew up in Montreal where he began experimenting with sewing projects inspired by Japanese magazines. He moved to Toronto after high school -- a strict Jesuit, all-boys school he says "put me off education in general" -- to pursue his fashion dreams. What resulted is a unisex take on streetwear staples with intricate detailing: slouchy sweatshirts and high-waisted pants adorned with snaps, panels, exposed zippers, contrasting stitch details and grommets. "I'm not coming from the approach where there are a specific set of rules on how the patterns are made, how the finishing should be on the inside and what kinds of clothes (I) should be making," he says of designing without formal training. "The luxury market for ready-to-wear is really crowded right now and what I think sticks with consumers are things that are recognizable and easy enough to wear but with just a certain element to them that make them stick out, make it special." Kruszewski plans to return to Toronto next week to wrap up production on his fall line. Pieces will head to Canadian stores including Simons and Nordstrom, as well as some small boutiques. He expects that list of retailers to grow as he builds his brand. But he's cautious about revelling in any successes he's had along the way. "It's not really in my personality to be kind of enthusiastic verbally but I'm always smiling on the inside," Kruszewski says. "It's better to just kind of be discreet." What would the founding fathers think? 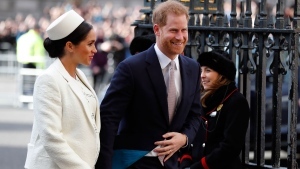 Almost 250 years after the United States launched a revolution to rid itself of the British royal family, the next royal baby could be an American.